Mentor Connection is on hiatus. 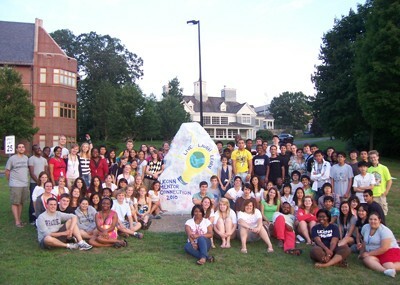 UConn Mentor Connection is a residential enrichment program held during the summer on the Storrs campus of the University of Connecticut, serving students entering the last two years of high school. The program is designed to provide rising juniors and seniors from diverse backgrounds with opportunities to participate in high-level creative projects and research investigations under the supervision of university mentors. 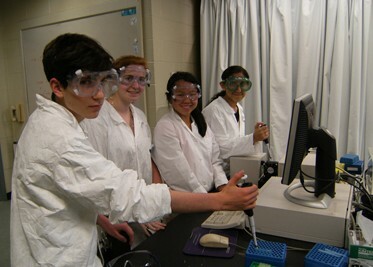 Accomplished university professors and/or advanced graduate students host participants in their labs and studios and work with them on projects in shared areas of interest. Students and mentors become a community of scholars working together on important issues on the cutting edge of various fields of study. The mentorship experience allows high school students to take on the role of practicing professionals, experience real-world research and/or creative projects, enhance their awareness of their talent areas and career opportunities, and interact with students who share common areas of interest. College credit is an option at most mentorship sites. UConn Mentor Connection is on hiatus indefinitely. Anson Ma, Chemical and Biomolecular Engineering mentor, wins Arthur B. Metzner Early Career Award. Featured UMC Alumni- Where Are They Now? 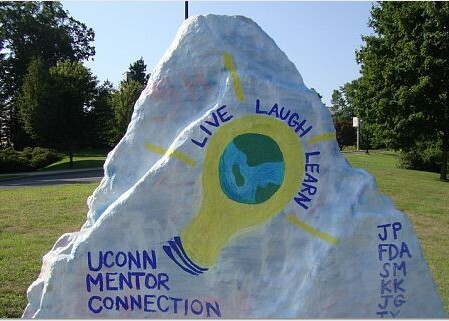 "Since participating in UConn Mentor Connection, I matriculated into UConn. I study molecular and cell biology as a pre-med student. In addition, I have been conducting research with my former Mentor Connection advisor, Dr. Campellone. Fortunate to receive the competitive Holster Scholar First Year Project grant, I worked on an individualized project on the role of the cytoskeleton in Parkinson’s disease. I continued the project into the semester as part of an independent study, and I presented my results at the UConn 18th Annual Frontiers in Research Poster Exhibition. Supported with the UConn Summer Undergraduate Research Fund (SURF) award, I will further investigate Parkinson’s disease in the summer of 2015. UMC gave me a valuable opportunity to gain lab experience early, paving the way to launching a formal independent research project pertinent to my field of study. I realized the importance of research and how much I can learn from performing the techniques that I read about in textbooks. Because of my experiences in UMC, I wanted to continue researching interesting topics, produce publications, and share my findings. I plan on earning an M.D./Ph.D., incorporating medicine with my own research to better develop treatments and solutions for various diseases." "I am currently a pre-med student majoring in physiology and neurobiology at University of Connecticut. Upon entering UConn, I rejoined Dr. Markus's (my former UMC mentor) lab so that I could continue behavioral neuroscience research. Since then I have been awarded University Scholar to conduct an in-depth research project on the brain's spatial navigational system and its implications in the cognitive decline of Alzheimer's disease. This summer I will have the opportunity to solely focus on my research project with UConn's Summer Undergraduate Research Fund (SURF). When I'm not in the lab, I enjoy volunteering through Community Outreach as the Program Director of Windham Hospital's Volunteer Program and being an active member of UConn's Honors Program. UConn Mentor Connection allowed me to participate in research for the very first time and has greatly shaped my undergraduate career. Prior to this program, I was unaware that research even existed! After participating in UMC, I learned to develop an experiment, produce a hypothesis, and analyze data using various lab techniques. I was able to hone my abilities as an independent and critical thinker. As I became more involved in undergraduate research, I discovered my passion for scientific investigation and became particularly fascinated by the brain and its neurological processes. Due to my passion for science and medicine, I pursued summer research opportunities at Virginia Tech and Harvard Medical School where I conducted neuroimaging studies. My research experiences have provided me insight into the translational value of neuroscience research and the complementary nature between research and medicine. I hope to attend medical school and continue research as a neurologist."